Allows screens with VESA 200 mounting patterns to be mounted on mounts with VESA 75, VESA 100 or VESA 200 x 100 mounting patterns. 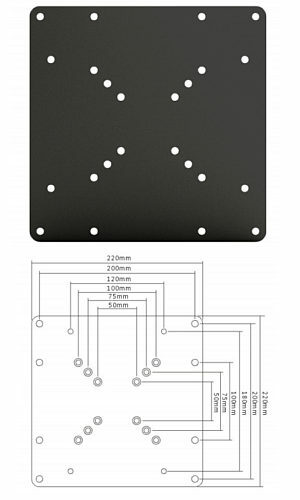 The adapter plate allows screens with 200mm x 200mm moutning patterns (VESA 200) to be mounted on the BT7515 or SIGB886 mounts. The plate simply bolts to the mount and TV. 200 x 200 Tilting TV Bracket, for 14 to 37 inch TVs, Slim Profile. Tilting slim profile TV bracket. 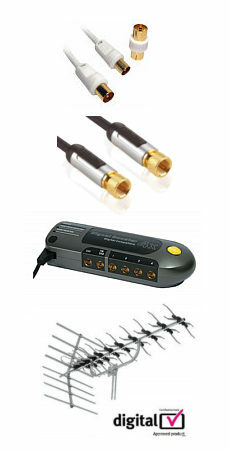 Universal for LED/LCD/PLASMA TV. Max weight: 30kg / 66lbs Suits screens 14 inch to 37 inch Supports Vesa 50 x 50mm, 100 x 100mm & 200 x 200mm Adjustable display tilt +/- 12.5 degrees. Distance to wall: 28.5mm Constructed from Steel Colour: Black Supplied with rawl plugs and fixing kit.